Gutters are the first line of defence when it comes to protecting your home from water damage. Gutters guild and lead water away from your home and they help to protect the exterior walls and doors of your home. With time, gutters get damaged after withstanding several harsh weather conditions and if you are not careful, water can easily seep into your walls and cause basement flooding. It is more expensive to do damage control caused by damaged gutters than it is to repair or replace them. Gutters can last for decades and therefore, homeowners cannot easily tell when it is time to replace their gutters when the need arises. 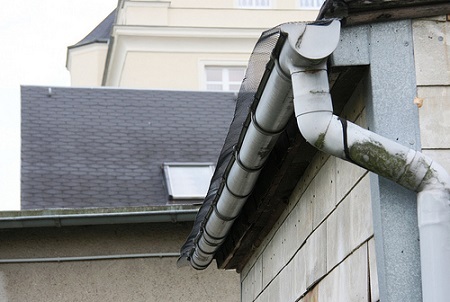 If you are not sure whether your gutters need replacing, these are warning signs that you should look out for. It is not easy to notice small separations and decay unless during a large storm. Once in a while you need to monitor your gutters, especially in large storms to detect points of weakness in your gutter. Most people tend to overlook tiny amounts of decay and small separations on their gutters. When they decide to act on the matter, they simply use sealants to manage the problem but this is usually a temporary solution. With time, the problem worsens and it is only a matter of time before they need to replace their gutters. Also known as gutter joints, gutter seams are sections that join gutters. Over time, gutter seams weaken and they develop gaps which allow water to seep through during a heavy downpour. If you notice gaps on your gutter seams, you need to call in professionals who specialise in repair/replacement of gutters in Toronto. One certain way to tell that your gutters need replacing is when you notice the fading of the paint. Aluminium gutters are painted using baked enamel which makes it hard for them to flake or peel. However, after being exposed to the sun for long, the paint on your gutters fades. Paint plays a vital role in maintaining your gutters because it repels excessive moisture from getting into your gutters. 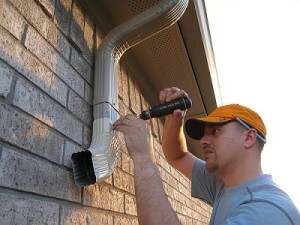 If you notice that your gutters are faded, you have an option to repaint them. You can only do this if you are a 100% sure that there are no underlying issues on your gutters. The best way to handle faded gutters is to replace your gutter system to avoid future complications. If you notice mildew or pools of water showing up near your home’s foundation that is not a good sign. Gutters are meant to lead water away from your home and that is why they are fitted with downspouts to ensure water flows a few feet away from your home’s foundation. When water starts to build up near the foundation, it eventually gets into the basement which results in smelly mildew growth. So, if you notice water pooling near the foundation of your home, this is a sign that your downspouts and gutters need replacing. Whether you gutters need replacement or not, you need to ensure that you occasionally maintain fasteners which hold your gutters along your roof’s edge. If you find that you keep re-securing fasteners because your gutters are pulling away from the roof that should be a warning sign that your gutters need replacing. Gutters end up sagging if your fascia boards are rotting, there is stress on gutters brought about by snow damage or your gutters are waterlogged. When this happens, replacing your gutter becomes imminent. When you notice watermarks underneath your gutters that is a clear indication that they are overflowing or leaking. If left unattended for long, this type of water intrusion causes damage to your fascia and soffit board. An eavestrough is a gutter than is fixed beneath the edge of a roof – and cleaning an eavestrough is a daunting, and often, a dangerous task to perform. Without proper equipment, and without taking accurate safety measures, it is all too easy to slip and fall, or hurt yourself while cleaning out the eavestroughs. It is recommended that you hire a private company, or call a professional service, to clean your eavestroughs for you – for professional services will be able to finish the job with efficiency, and will make sure that adequate safety measures are followed while doing the job. While looking for professional services, or for companies that allow you to hire their professionals for eavestrough cleaning, it is imperative that you ask the serviceman for their past references, or past clients. If the serviceman refuses to divulge that information, then be wary of who you choose to hire. If you do manage to obtain any information about the past clients and customers, it is advised to give them a call, or to contact them in some way to see just how good this company is – for personal feedback from other customers is always honest and can be trusted. Make sure to ask former clients about functionality and efficiency, and how well the job was done. The next thing to check on while looking for eavestrough cleaning companies is whether they have the appropriate licenses and legal requirements to practice their profession in the area you’re living in. Make sure that the company whose services you choose to hire has some form of insurance to offer as well, in case something goes wrong during the cleaning service, so you won’t be held liable for any damages caused, to either property or to the servicemen. It is recommended that you visit the offices of the cleaning company at least once, and see the interior of the offices for yourself; and the demeanour of the servicemen and administrative staff as well. This is nothing but simply confirming the professionality of the company you choose to hire, and whether the servicemen are experienced and are respectful and professional in the workspace. Another benefit to visiting the offices is that it’s easier to have your questions answered, including questions about the rate at which they charge you for their services, or price ranges for various packages offered, if there are any. This way, it is useful to get professional advice as well – in case you feel as though you can do the job on your own, it is always useful to get advice from a professional, to know the best way to approach and tackle the problem. Century Aluminum is one such company that offers its services for protection and maintenance of your property. Being accredited by various boards gives those who approach Century Aluminum a sense of satisfaction, knowing that professional service will be guaranteed. Century Aluminum offers its expert services to the public at very competitive market rates, ensuring that everyone involved – servicemen and customers – are satisfied. How Does Gutter Cleaning Keep Your Home Safer? Gutters are designed for gathering water from your house and then removing it from your place as well. The water accumulated on your roof needs to drain somewhere. Because of this reason, gutters are specially designed to force water off the roof. In case of clogged gutters, they fail to perform their due task and results in water accumulation. This matter should not be ignored for a long time because it poses threat to the overall structure of the house and there is a chance that you get a leaky roof very soon. There are several health benefits associated with clean home gutters as well. Leaky roofs invite moisture inside and this ultimately leads to mold and mildew growth. Mold and mildew have severe side effects on the overall health of homeowners. They are usually known for instigating respiratory ailments. Once you have clean gutters in your home, your family members can enjoy a healthy environment. If the gutters have not been cleaned and are clogged for a long time, there comes a time when replacement of the entire roof becomes mandatory. This is surely an expensive project but you will have no other choice then. Hiring professionals for cleaning gutter is easy and cost effective at the same time. There is a considerable difference in their service charges and the cost of replacing roof. Stagnant water happens to be an ideal breeding space for mosquitoes and other insects. They breed and spread different types of diseases. Once the moisture is present in your home, you are welcoming termites and cockroaches that also pose serious health issues to the homeowners. Clean gutters ensure a healthy environment in the house and keep the home dwellers safe from many diseases. Once water starts accumulating on the roofs, it begins to leak down the walls of the building and ultimately sinks into its foundation. This would surely damage the foundation gradually. It is the foundation of the house that determines the overall strength of the structure. If the foundation is damaged, its strength would diminish gradually as well. Leaky roofs, moisture accumulation, moist walls and insects’ proliferation never portray a nice image of the house. These elements also have a psychological effect as well. A well cleaned gutter makes it easy for the water to leave the house easily and helps in maintaining the true essence of the house. If you have no time to clean gutters at your own, you can always seek professional assistance in this regard. It will not be wrong to say that the beauty and the true value of your house are dependent on the quality of gutters. Gutters that is full of debris, leaves and other materials become heavy. When water overflows, it leaks behind the gutter and later seeps into the house. If you want to protect your house from any structural damage, you must be vigilant in keeping the gutters clean. You just need to give this area its due importance and you will feel the difference yourself. What Happens During A Biannual Gutter Inspection? Gutters perform a critical task of diverting rain water away from a home’s foundation. However, they end up collecting lots of dead branches, leaves, dirt, and other debris. As such, it is advisable to inspect the gutters at least twice a year in order to make certain they are enduring the elements well, continuing to do their job and they are free of debris as well as dirt accumulation. 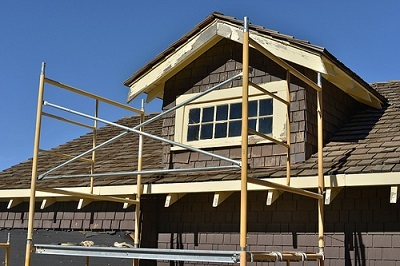 During a biannual inspection, ensure to have the gutters and eaves troughs thoroughly cleaned, the slope of the horizontal sections at the edge of the roof checked, and the drainage coming out of the downspouts examined. If you opt to carry out these undertakings yourself, then you must have tools such as garden hoses, ladders and gloves in your possession. What Type Of Material Should You Consider For Your Gutter? Wooden gutters are rarely installed now because it is much more expensive when compared to other types of gutters. In fact, prices range from $12 to $20 per linear foot. You can say that is quite cheap but you have to consider that aside from that, wooden gutters also require a lot of maintenance prior to and after installation. This material is rust-free because of its natural patina. It can last long that is why many people have used such a material for constructing their gutters. Price ranges from $15 to $20 per linear foot so prepare some cash if you want to have copper. This is easy to cut to the size that you want and you can even do it yourself. It is also rust and rot-free. They come in various colors and this gives you the option to choose which hue matches your house. However, it is not that lasting because they get brittle when exposed to extreme cold, heat or with age. If you live in a tropical area, this type may be good for you. It is less expensive with its price of $3 to $5 per linear foot. If heavy precipitation is your concern, then this is for you. It can hold up against weather elements and can last forever provided you have it treated prior to installation so that it will not rust easily. Otherwise, you will end up spending money for an investment that is not worth it. This is the most commonly used material for gutters because it is rust-free. Although it is not as strong as steel or copper, it can endure extreme weather changes. If you decide to use aluminum gutters, choose primary aluminum as this is more likely to have a consistent quality compared to a secondary type. These are not only the considerations in choosing your gutter materials. You should also pay attention to its structure. It could be seamless or traditional. Seamless gutters come in one piece but do not be misled by the idea that they do not have seams because they do. These are at the ends of the gutter and at the corners. Leaks may start from any of these areas. It is an advantage to have this type because it does not require too much cleaning and birds have no way to go in. The only disadvantage of this gutter is the cost and you need to hire a professional gutter installer. On the other hand, traditional gutters come in sections. Damaged segments can be easily replaced without taking off the whole thing. The drawback for this type is it requires to be cleaned often. Its in-between seams should be cleaned of debris regularly for this may result to the formation of rust and sediments. Gutter size should also be a factor in choosing. This greatly depends on the climate of the area where you reside. If you live in an area with heavy precipitate, have a bigger or wider gutter. A house built in an area with many trees needs a wider gutter to avoid clogging of leaves. Apart from materials, its different types and sizes, it also pays to consider the design of the gutter before building one. Amongst designs to choose from are k-style gutters which has a decorative shape that makes them look like crown mouldings. These gutter designs are available in a wide array of option that you can choose from. Half-round gutter versions are also available. These ones are made of half-round tubes and are most popular in historic or traditional homes. Gutters in Toronto come in different shapes and sizes with different materials that can be used for construction. Each type of material used in gutter construction differs from those of others – this is one thing to take note of. With these different materials come pros and cons too. It can involve sturdiness and cost which are obviously vital to making a purchase. You have to weigh in also on all other factors that are crucial with the investment. The bottom line is you must pick one material that you think will work for your needs in the best way possible.